You cannot purchase more than we have in stock. Add to basket to view shipping cost. 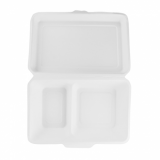 Our 9 x 8 inch clamshell box is made from bagasse - an eco-friendly alternative to polystyrene. This natural material has great thermal properties but doesn't trap condensation like plastic, so food stays hot and crispy. Freezer and microwave safe. Burgers or any hot or cold food to go. 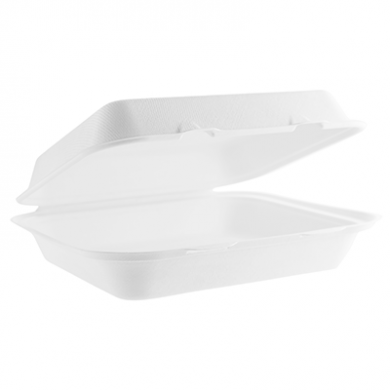 Materials bagasse - recycled sugarcane. Bottom clamshell is 33mm deep - with 35mm space in top clamshell. 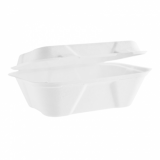 Vegware products are specifically designed to be safe and suitable for organic recycling. Any paper surface that comes into contact with food is made from sustainable forest virgin board. The bulk of our recycled products are not made from paper but bagasse fibre which is left over after sugar cane has been pressed. They use non-toxic vegetable, water-based inks or where necessary a UV-process which evaporates harmful chemicals. We encourage you to either compost on site or have your food waste collected by www.foodwastenetwork.org.uk. Founded in 2006 by Joe Frankel, Edinburgh-based company Vegware is the UKs first and only compostable food packaging company. You can't recycle plastic with food on it, and you can't compost food mixed with disposable plastic waste. So Vegware makes disposable plates, cups and cutlery that can be mixed in with food waste and composts naturally. So now in your cafe or at your event you can provide your customers with just one bin into which all the waste you generate can be placed and composted. The production of plastic requires the extraction of oil and all the war and environmental destruction that brings. Oil creates huge amounts of carbon. With Vegware you can join the thousands of companys that are refusing plastic disposables and reducing the UKs carbon footprint by hundreds of tonnes. 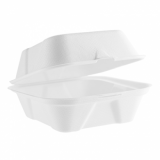 Vegware products are compostable which is much better than biodegradable. Biodegradable materials break down naturally over time, but 'compostable' means it all happens much quicker - between 8 and 12 weeks in the right conditions. Not only does composting your disposables save the planet - but its saves money too. With landfill charges going up every year with Vegware you can access the Food Waste Network who will match you up with a food waste recycler. It has been a fantastic journey. When we started, sustainability was a niche concern. It took years of research and development but now our full range can be commercially composted together with food waste rather than go to landfill. 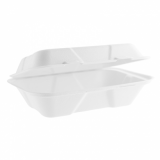 Now Vegware's eco catering disposables are used at 50% of the UKs universities, and at corporate restaurants and artisan cafes all around the UK. You have a legal right to change your mind about a purchase within 14 working days of receiving it - this is called your 'Right to Cancel'. So if you decide you don't want this item return it to us and we will refund you your purchase price. Please note that if you have used the item, damaged the packaging etc we will not be able to sell it for its full price - so we will offer you a fair price for it. If the item is faulty and less than a year old we will take it back and repair or refund it. If it is over a year old we will give you the manufacturers details. For more information about returning an item to us please click HERE.